Recruited from Oklahoma State University (OSU), Cox became the tallest player ever measured at an AFL Combine in 2013, standing an imposing 211.4 centimetres. Projected as a potential ruck or key position player, Cox was originally a standout performer the US International Combine in Los Angeles, with his supreme athleticism drawing plaudits from recruiters across the AFL. Recording elite vertical jump scores, including the second highest left-footed running leap ever documented by the AFL in 20 years of testing, Cox also demonstrated impressive speed and agility for his height, completing the 20-metre sprint in three seconds flat. As far as raw talents go, few have been thrown into a deeper end than Cox. Having never played a game of Australian Football in his life, Cox made his debut in a NAB Challenge match against Carlton in Bendigo in February, 2015. He recorded just one handball, but won 14 hitouts and plenty of pats on the back for performing at such a high level in his first outing. With unmatchable size and a number of ready-made attributes to suit the AFL game, Cox went on to take numerous leaps and bounds in the VFL side in 2015. He played 19 games, averaging 8.3 disposals and 22 hitouts per game. 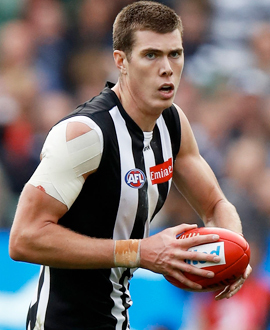 Cox’s 211cm frame meant he was predominantly used as a ruckman, but the presence of Jarrod Witts and Brodie Grundy in the VFL during some parts of the year led to him also settling deep in the forward line. Despite having grown up without a Sherrin in his hands, the American worked his way to becoming a dead-eye in front of goal. Against Richmond in round 19, Cox kicked five straight goals as the Magpies cruised to a 42-point victory at Victoria Park. He made a remarkable debut on ANZAC Day 2016, marking and goaling with his first kick in senior football during the opening minutes.